Keeping an eye on your pets is always important. You want to make sure they’re safe and happy even when you’re gone, right? You want to make sure you can check on them to make sure of that. With our pet camera review options right here you’re going to have no problem doing all of that. Each of them has great features that will help you take care of your furry friends. But how do I choose the best pet camera? Video Recorder: Can you record the information that the camera captures? You may just want a way that you can look at your pet but if you want to keep the information you see then a video recorder is an important aspect. Interactive: Can you actually talk to your pet through the camera or is it only for you to look in? For some people this is an important step because it keeps you involved with your pet throughout the day, but not always. 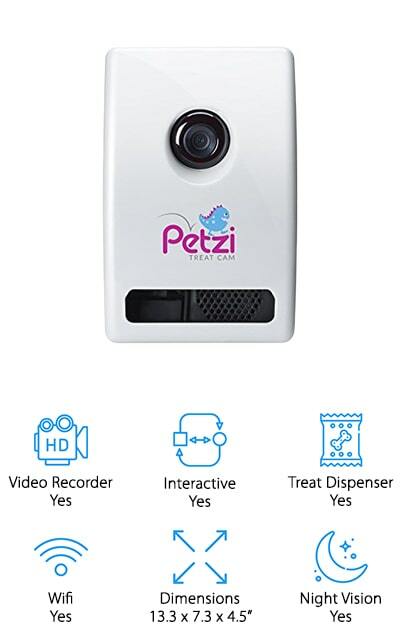 Treat Dispenser: Can you give out treats to your pet from the camera? This can make sure that you’re really able to interact with your pets and that you’re able to reward good behavior or make yourself feel closer to them. Wi-Fi: Does the system run off of Wi-Fi? This can affect the way that the camera actually works and whether it could be difficult to connect if there’s a problem in your area. It does provide versatility in some ways though. Dimensions: How large or small is the camera? A small camera can be easily hidden away or kept out of the way when it’s not needed, but it may be more difficult to use. A larger one can be difficult to conceal, however. Night Vision: Is there night vision to the camera? This can help you see your pet even if there are no lights on in the house. You’ll be able to keep a closer eye on them no matter what’s going on. Just make sure you look for this feature. So what do you do? What is the best pet camera? You want to make sure you have something high quality that you and your pet can enjoy. Take a look at each of these cameras and see which one might work for you. There are plenty of options and if you’re not sure about any of these you can easily take a look at more options. That way you know you’re getting the best of the best. This wireless pet camera is designed to give you and your pet all the connection that you could possibly want. 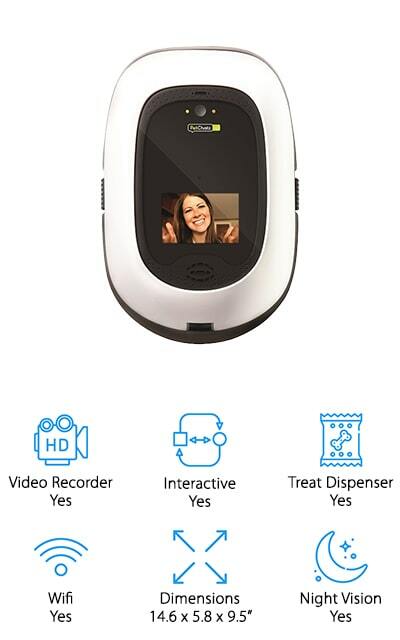 It’s a 2-way camera that not only lets you talk to your pet but lets them hear you and communicate back. On top of that, it has motion and sound detection so your pet can trigger the camera whenever they want. There’s even a treat dispenser so you can reward them while you’re not around to physically hand out treats. You can play games, use aromatherapy and more with no problem and your pet will feel even safer being able to see you anytime. Designed and made in the USA, this camera has no corners and no edges or cords, so there’s no danger of your pet chewing on it. 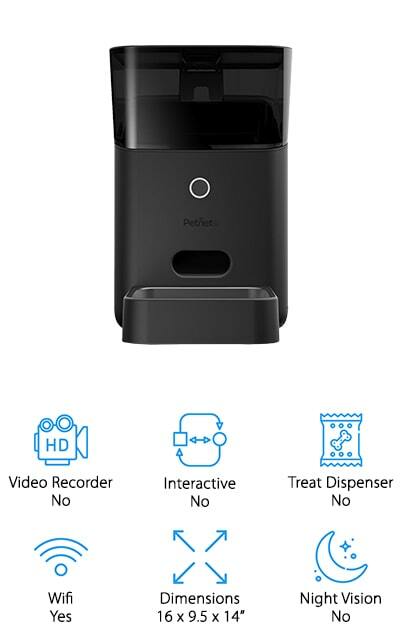 Our budget pick is a great social pet camera & treat dispenser that works with your home assistant device. It can toss treats using a simple app and you can even play catch. You’ll have an HD camera as well as night vision for those times you have to be away overnight. On top of that, there’s 2-way chat and a bark alert that lets you know when your pet is barking. You get a notification directly to your smartphone to let you know what’s going on. Plugging it in and getting connected to your pet is super simple. All you need is an internet connection and a wi-fi signal and you’ll be able to easily connect with your pet no matter where you are at the time and even check the video recorder for non-live feeds. If you’re looking for the best pet camera review this one should definitely be on the list because it may be the best pet camera you’ll find. It has a video recorder so you can check back even when you’re not live and it has a night vision mode so you can see even in the dark. You’ll be able to schedule automatic treat delivery or you can set up different distances to throw treats whenever you want. Designed to be interactive so you can communicate with your pet anytime you want, this 2-way system has could video storage included. All you need is a wireless connection and a device that can support the app and you’ll be able to start talking with your pet quickly and easily. No matter where you are throughout the day or night, you’ll be able to communicate back and forth and even set up wide angle or zoom. If you want a cheap pet camera this might be a good way to go because it’s not exactly designed for just pets. 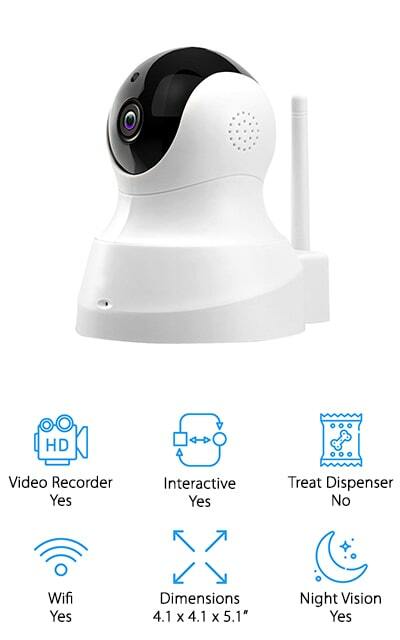 This is a security camera that you can use as a pet monitor as well, though it’s not going to let you communicate with your pet. Instead, this device is going to let you see what’s happening in your home no matter when you want to check in. It can be hooked to a home assistant and you’ll be able to keep your home, and your pets, more secure. 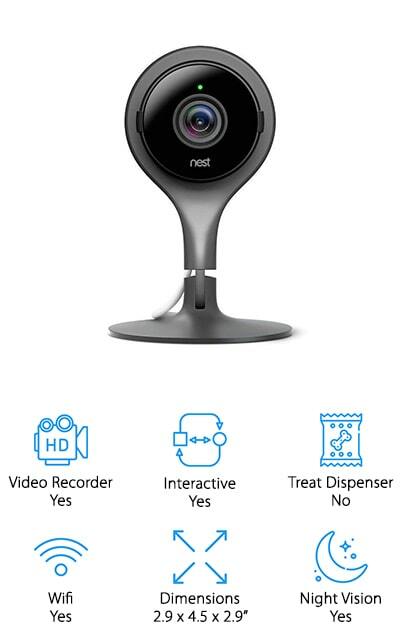 This device has night vision capabilities that make it even safer for your entire family and it will give you notifications directly to your smartphone through the Nest app if you turn on movement and activity detect. It can even tell the difference between different types of motion. This isn’t exactly the best pet camera collar or a social pet camera but it will let you know anytime your pet moves by the camera. It’s designed to let you check in whenever you want and makes sure that you get notifications for any movements as well. 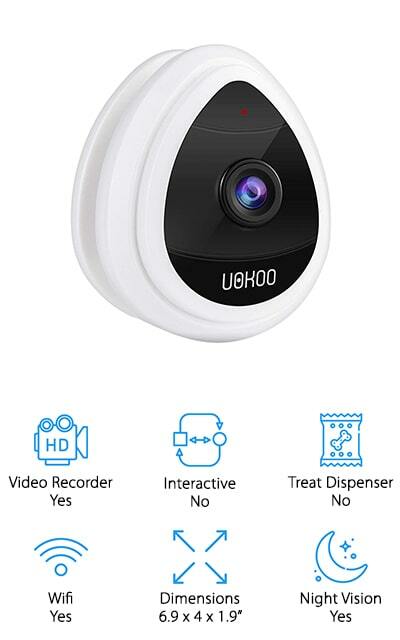 If you want monitoring for pets, a nanny camera or just a security device this is a great option to keep your family safer. You can even set up the sensitivity of the motion detection to make sure it’s not picking up pets. With the night vision capabilities on this system you’re going to have no problem getting a clear picture, no matter what’s going on or when. It also connects directly through your wi-fi so you’ll always have a connection and access to the camera. 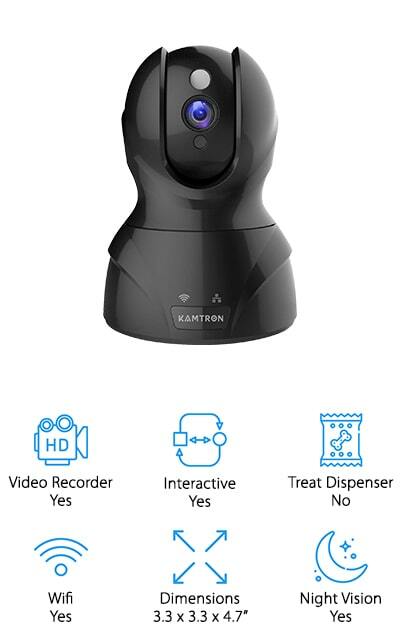 If you want the best Wi-Fi pet camera you might want to look at this one which gives you the wi-fi connection and also provides you with plenty of other features you and your pet are going to love. The night vision aspect means you can check in at any time, no matter how long you’re going to be gone. The video recorder even means that you can take a look at what’s happened earlier in the day or night to make sure everything is as it should be. You get a treat dispenser and the best way that you can connect with your pet by talking right to them. You’ll get automatic reorder when you get low on treats and you can control the device through the app and even share the videos and content it provides you. This remote pet camera is actually designed to keep everyone in your family safer. It’s not just a pet camera. It’s also a surveillance camera that can help you keep your home secure, keep an eye on your baby, or even work as a nanny camera. But it’s also one of the best interactive pet camera options you’ll find. Designed with night vision so you can see any time of the day or night, it connects directly into your wi-fi at home so you can check in any time through the app. 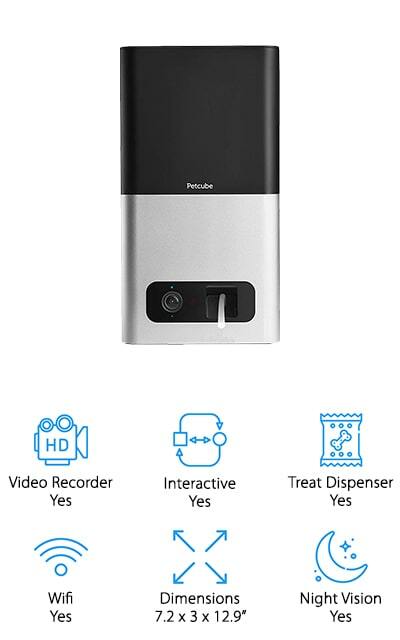 The video recorder lets you check back on anything that you want and the 3 second motion detection response means that you get a notification and up to 15 seconds of video for anything that happens in your home. You’ll also have no problem communicating directly with someone on the other side of the device. 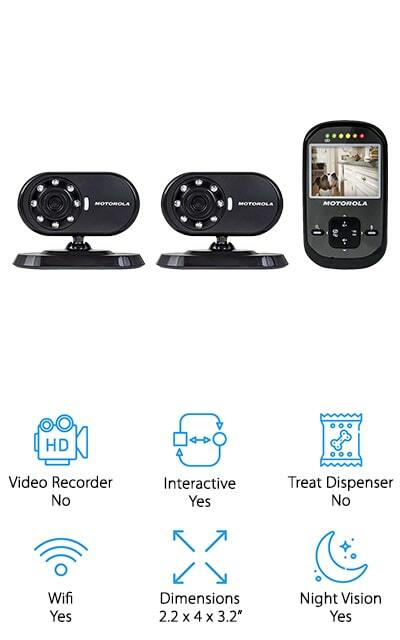 If you want the best indoor pet camera you want something that’s going to really give you the image that you’re looking for and this device actually has 2 different systems that you can install wherever you want. You’ll also have a monitoring unit that you can put anywhere you want. With the night vision, you can even see what’s going on when it’s dark. Your pet can see you on the monitor and the sensitivity of the microphone means that you’ll be able to talk right to them as well. There’s an LCD monitor that even lets your pet see you when it’s dark wherever you are and it’s full color at the same time. You’ll have low battery alert in case the monitor starts to run low and you can keep an eye on things much easier. This might be the best pet camera app that allows you to get connected any time of the day or night. It has night vision and has vertical and horizontal rotation so you can get a good view of any part of your room with no problem. There’s smart motion detection alerts and 2 way audio so you can communicate through your pet camera with speaker. You’ll also get motion alerts directly to your smartphone that let you know if anything is going on at your home. There’s cloud storage for the video recordings and the entire device only needs wi-fi in order to run so you can set it up and be ready in no time at all. The video also has full financial encryption so no one else will get access to your device or recordings. 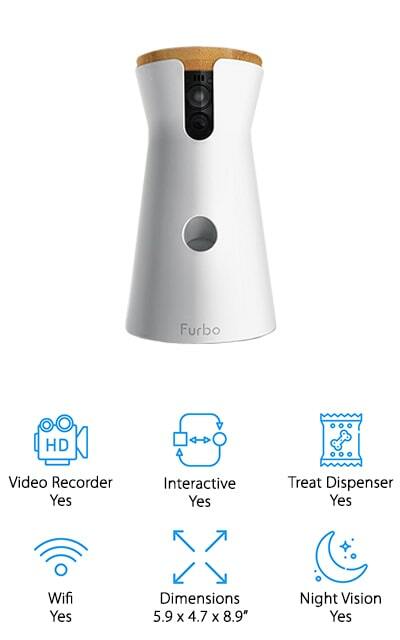 This isn’t a pet camera with night vision, but it is a great option if you’re looking to better control your pets feedings. It actually works with a home assistant and lets you control when your pet gets their food through the app. You get to personalize the portions though the device will recommend portions for you based on the size, age, breed and activity level of your pet. You’ll even get notifications if your pet food is running low or when your pet has gotten their food. When you’re ready to refill you don’t have to worry about your pets getting into the food because there’s a self-locking lid and a metal bowl, plus you can clean it super easy. The battery even has up to 2 days of battery life and is rechargeable.